Café Xoho is a neighborhood Café near the corner of Mapu and Ben Yehuda Street in Tel aviv that serves locals, visitors and tourists. The Café has a European feel and provides entertainment in a fragrant living room setting. 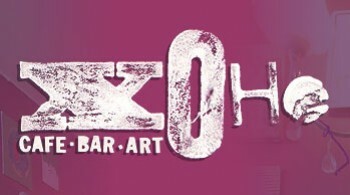 The concept of Xoho is based on a personal touch and an emphasis on warm customer service. Art can be found in everything, from the creative atmosphere and the walls, to the tables and the presentation and flavor of food on the plate. The Menu at Café Xoho is Vegetarian and includes fish, cheese, homemade pesto and jams, fresh and roasted vegetables, baked goods, cakes and desserts…all of which are prepared and made every morning in the café by the friendly kitchen staff, who will often personally bring dishes to the table. The sandwich menu is extensive and customers are invited to choose between a whole wheat bagel, ciabetta or sliced bread as the base for their meal. The Salmon Bagel is very popular and is served with the works': cream cheese, smoked salmon, onion, tomato and a spritz of lemon. “The Dream” – a Haloumi sandwich that features Xoho spreads and fresh vegetables is also a bestseller. All sandwiches are served with a delicious side salad (22 – 39 nis). In addition the “Pimp Your Sandwich” section allows customers to upgrade their sandwich with a chosen spread for just 2 nis. This includes spicy mayonnaise, honey mustard and homemade hot sauce!